Add a splash of sophistication to your decor with Florita Polished Marble Mosaic Floor and Wall Tile. It features flower styled pieces of polished white Italian marble, lending an upscale look and contemporary flair to any interior expanse. The high-sheen, smooth-finished genuine stone chips are perfectly arranged on a 13.2 in. x 13.2 in. mesh-backed mosaic, which seamlessly interlocks with other tiles to create a transition-free appearance. Suitable for residential and commercial use, this ornate tile has a distinct pattern that is certain to inject space-defining allure into any setting. Note: Inspect all tiles before installation. Natural stone products inherently lack uniformity and are subject to variation in color, shade, finish, etc. It is recommended to blend tiles from different boxes when installing. Natural stones may be characterized by dry seams and pits that are often filled. The filling can work its way out and it may be necessary to refill these voids as part of a normal maintenance procedure. All natural stone products should be sealed with a penetrating sealer. 1.21 square feet per piece, each piece sold individually. Piece weight equals 4.5 lb. Buy online MS International Florita 13 in. x 13 in. 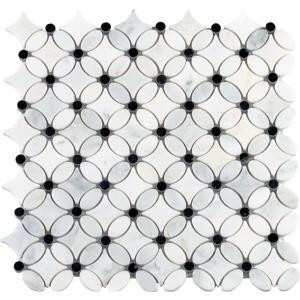 x 10 mm Polished Marble Mesh-Mounted Mosaic Tile FLORITA-POL10MM, leave review and share Your friends.